Toon resultaten voor tags 'solo'. For more than four centuries scholars have argued over the identity of the mysterious Dark Lady of William Shakespeare's sonnets. According to the sonnets, the Dark Lady seduced the poet and held him in an agonised thrall while also conducting an affair with the Fair Youth whom Shakespeare also loved. In Black Sonata you will find yourself in Shakespeare's London, circa 1600, in pursuit of the shadowy Lady. A specially ordered deck of cards determines her hidden movements from place to place. You must deduce her location and then intercept her to catch a glimpse and gain a clue to her identity. You will need several clues to deduce her identity, but with each clue gained the Lady becomes harder to track. 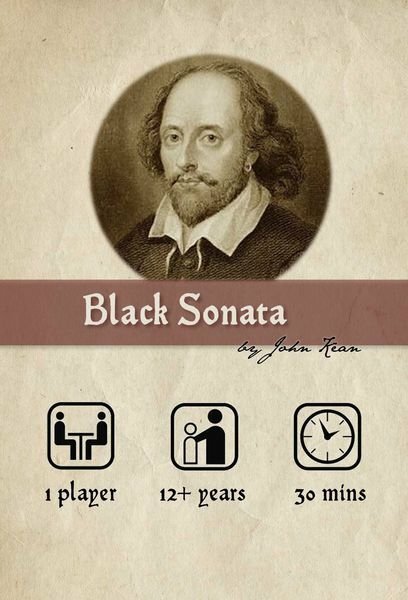 Black Sonata combines hidden movement and logical deduction into a unique solitaire steeped in literary history. Can you finally solve English literature's greatest mystery? Or will the Dark Lady elude you, melting from your grasp like a curl of smoke and promises? One Deck Dungeon is a card game "roguelike" — a dungeon delve that is different every time, difficult to survive, with a character you build up from scratch. The deck consists of various foes to combat and other perils from the dungeon. Each card depicts both the obstacle to overcome and the potential rewards for doing so. When you defeat a card, you claim it as either experience, an item, or a skill, tucking it under the appropriate side of your character card to show its benefits. The longer you take exploring the dungeon, the deeper you'll delve, and the difficulty will scale up quickly! If you make it far enough, you'll have to fight the dungeon boss. Survive, and you'll be a legend! 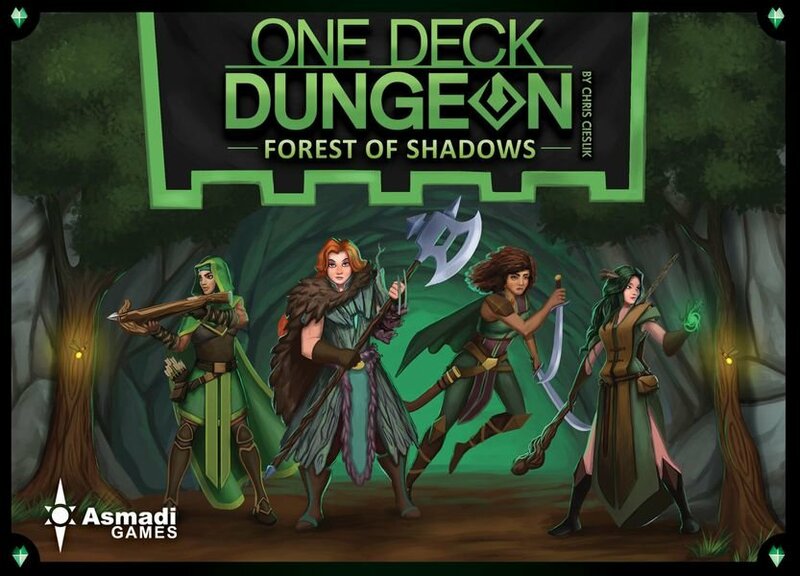 One Deck Dungeon: Forest of Shadows is a standalone expansion for One Deck Dungeon that contains new heroes, new dungeons, new perils, new foes, and new mechanisms: Poison and event Perils! 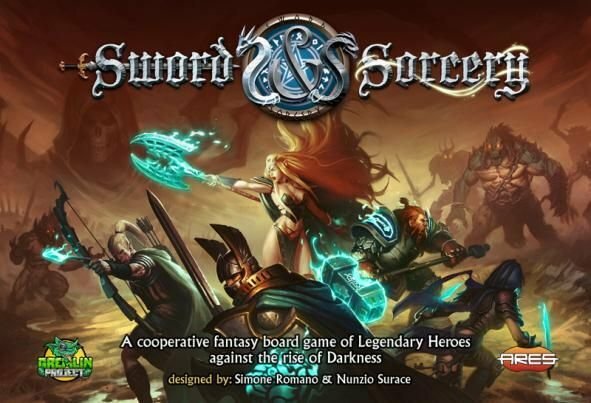 It can be combined with the original game for a hybrid dungeon experience, with the heroes and dungeons being compatible with the original, or played on its own. De nieuwste topper van Stonemaier Games heet Wingspan. 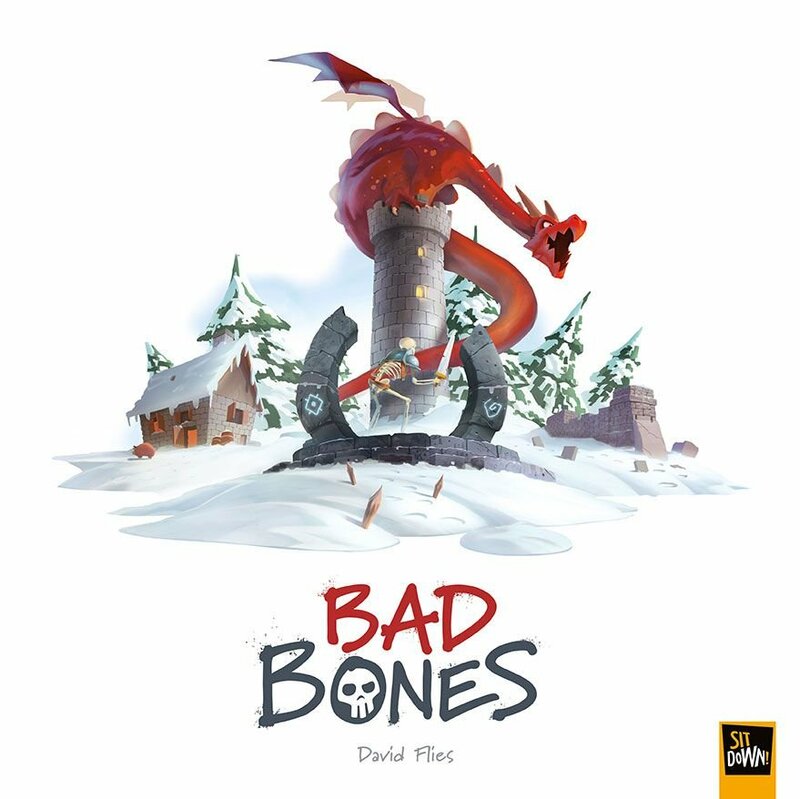 Verkopen van dit spel verbaasde zelfs Stonemaier Games... de preorders bleven oplopen. Maar is het de "hype" waard? Het antwoord is: Ja! Gisterenavond hebben we Wingspan voor het eerst gespeeld. Uiteraard had @Deluxe Roelbookdit spel in de pre-order gezet zodat hij erop tijd bij zou zijn. Zoals bekend ben ik geen fan van euro's maar zoals wel vaker bij Stonemaier Games vind ik Wingspan niet te zwaar en is het thema erg goed uitgewerkt. Het thema? Vogels! Iedere speler heeft een eigen bord waarop ze vogels kunnen wegleggen mits ze het juiste voedsel hebben voor de vogel en de benodigde eieren. Er zijn 3 rijen: lucht, grond en water. Iedere vogel heeft ook zijn eigen gewenste leefomgeving en zul je ze daar ook moeten zien te plaatsen. Vogels kunnen speciale acties hebben en zijn punten waard. In je beurt kun je een vogel spelen of 1 van de 3 rijen activeren: Voedsel halen uit dobbelsteen bak Eieren pakken Nieuwe vogel kaarten pakken Heb je in die rij ook al vogels liggen dan activeren deze ook. Op deze manier kun je er dus voor zorgen dat er meerdere zaken kunnen activeren. Het spel bestaat uit 4 rondes. Aan het eind van iedere ronde krijg je ook punten voor de rondebonus die op dat moment actief is. De eerste ronde is dat wie de meeste eieren heeft op de vogels in de lucht rij. Wingspan speelt snel, heeft leuke combo's en maakt leuk gebruik van dobbelstenen om voedsel te pakken. Componenten zijn weer super met linnen finish regelboek, houten eieren en Gametrayz kaarthouder en token bakjes. Ja de hype is terecht! 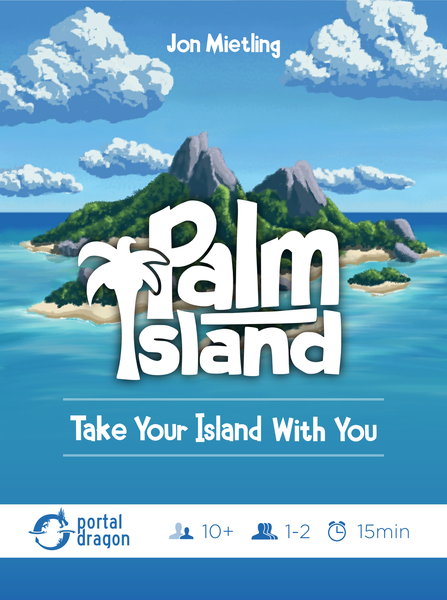 Palm Island is a portable game that you can take with you anywhere. Sitting, standing, waiting, riding, flying, relaxing, alone, or together you can play Palm Island no table required. Using a deck transforming mechanic a player uses just 17 cards over 8 rounds to shape their island and overcome its unique challenges. Store resources to pay for upgrades and upgrade buildings to access new abilities. Each decision you make will alter your village from round to round. At the end of 8 rounds calculate your victory points. Each card has four states or positions. The face-up, top section is the active area on each card and represents the card's current state. Through upgrading your cards with rotate and flip allowing you to access the other sections of each card and improve your village by increasing resource production and gaining more victory points. While playing solo, players can achieve feats by meeting specific criteria during their games. Once they have earned a feat, it's card can be used in all future games. Collect more feats for more abilities and score even more points. While playing with others you may play cooperatively working together to successfully prepare your village before natural disasters strike. These disasters scale based on player count allowing you to combine multiple copies of the game for more players or even play these challenges solo. You can also play competitively racing to recruit valuable new members for you village and use their abilities to score more points than your opponent. The game comes with 2 player decks, competitive cards, cooperative cards and solo feat cards. Multiple games can be combined to add even more players. 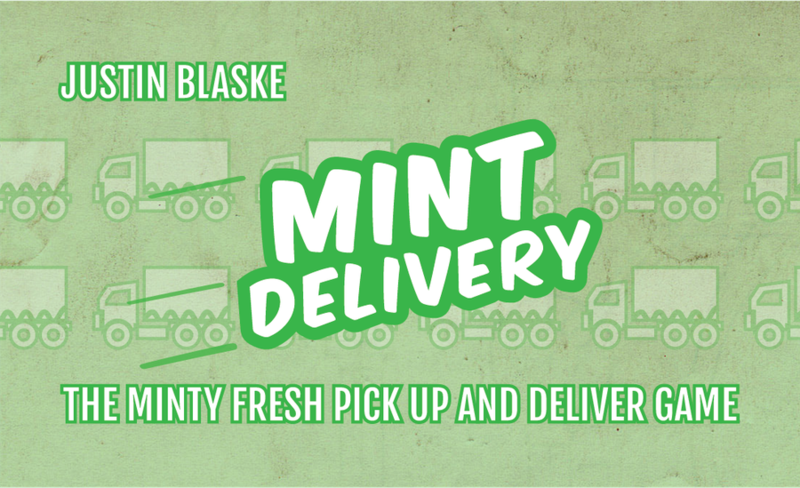 Mint Works is a light and straightforward worker placement game. Its compact size makes it easy to put in your pocket and take it anywhere. Its simple rules make it easy to introduce new players to the genre of worker placement. 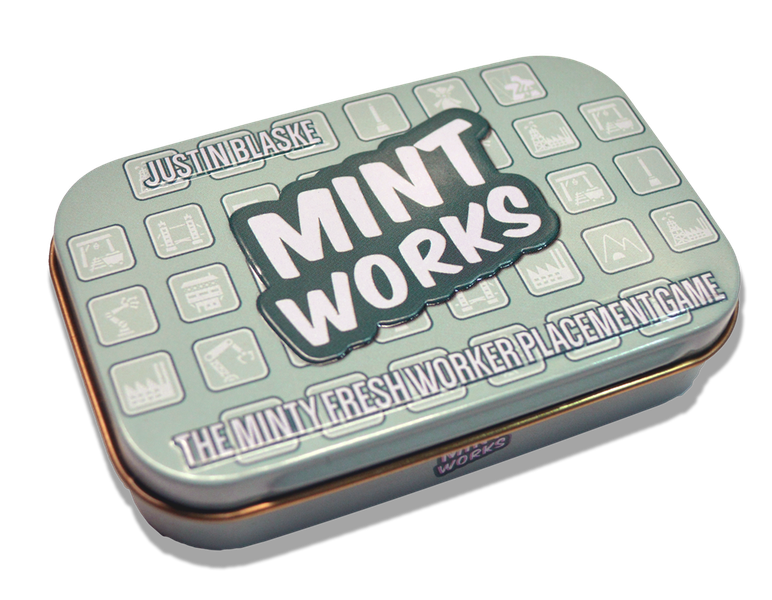 During the game each player will have a limited amount of Mint Tokens, which represent their workers. Players will use these mint tokens to earn more tokens, take first player or buy and build plans. Plans are how players earn points. Some plans will give only points, others will give extra powers to the owner. Once any player has at least 7 points earned (or if there are not enough plans to refill the stock) the end of the game is triggered. The game will then be over at the end of the current round. Whoever has the most points provided by plans they have built wins! 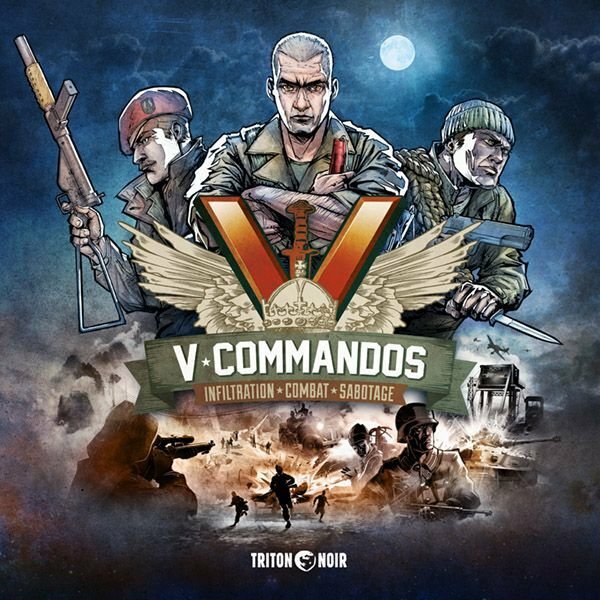 V-Commandos is a WW2 commandos co-operative board game. Players can either select a pre-generated mission or create their own by combining objective cards, then they assemble a team from famous Allied corps: U.S. Raiders, British SAS., Devil’s Brigade, SOE, etc. During play, you hide in darkness, wear enemy uniforms, and sneak up on your targets. Get spotted? Open fire with emblematic allied weapons and try to turn the enemy's weapons against them! If you can, get back to cover and turn off the alarms as the enemy has more available troops than you. Thus, you need to focus on completing the mission, then leaving the area as quickly as you can. You are a Dreamwalker, lost in a mysterious labyrinth, and you must discover the oneiric doors before your dreamtime runs out – or you will remain trapped forever! You may wander through the chambers of dreams, hoping that chance will reveal the doors, or you can linger in each type of room. In both cases, you will have to deal with the slithering Nightmares, which haunt the hallways of the labyrinth. 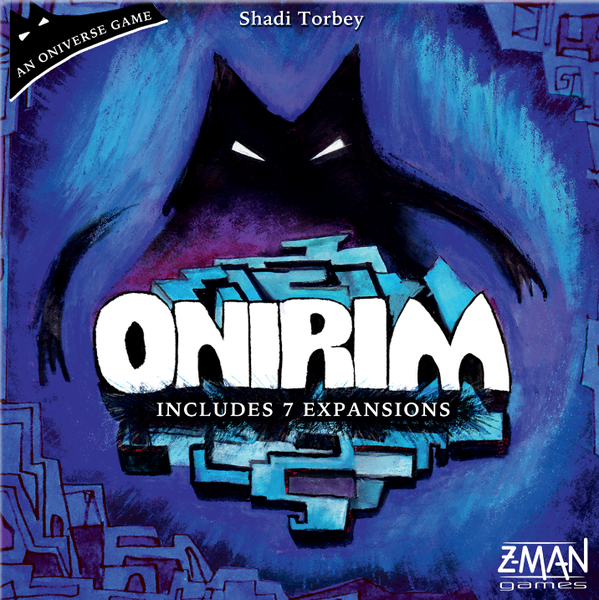 Onirim is a solo/cooperative card game. You (and a partner, if you wish) must work (together) against the game to gather the eight Door cards before the deck runs out; you can obtain those Door cards either by playing cards of the same color three turns in a row, or by discarding (under specific circumstances) one of your powerful Key cards. In both cases you will have to decide the best use of each card in your hand and carefully play around the Nightmares. Those cards are hidden in the deck and will trigger painful dilemmas when drawn... Seven mini-expansions, all standalone and compatible with one another, are included with the second edition of Onirim, including these three that were in the first edition of the game: 1) "The Towers" introduces a new type of card that allows more searching and deck manipulation, while also imposing an additional victory condition. 2) "Happy Dreams and Dark Premonitions" adds evil time bombs that will impede your progress at predictable moments of your quest as well as helpful but unreliable allies. 3) In "The Book of Steps Lost and Found", you must find the eight Door cards in a randomly given order and may remove discarded cards from the game to cast powerful spells that will help you complete this difficult task. In addition to these three variants from the first edition, there are four new modules in the Onirim 2nd edition box. Just like previously, each module consists of something that makes the game easier and something that makes the game harder: 4) "The Glyphs" introduces a fourth symbol on location cards (apart from Key, Sun and Moon), which makes it easier to compose the row of unrepeated symbols. Player must then find one extra door of each color (so 12 doors in total) to win 5) "The Dreamcatchers" are four cards that "guard" the Limbo piles. The Limbo pile stays with Dreamcatcher until some effect allows the player to shuffle the pile back to the deck... if all Dreamcatchers are full and new cards should come to Limbo, a Dreamcatcher is discarded and his cards shuffled back. Also, four new "Lost Dreams" cards are supposed to be in Limbo at the end of the game, as an extra winning condition - so discarding all Dreamcatchers means loss. 6) "The Crossroads and Dead Ends" introduce location cards with a given symbol (3 Sun, 2 Moon, 1 Key), but serving as any color "joker". It also contains 10 "Dead End" cards, that remain in players hand (un-discard-able on its own) and block her 5-cards hand limit... until a player discards the whole hand (=the only way to discard a Dead End). 7) "The Door To The Oniverse" brings several one-time abilities cards as "inhabitants of the Oniverse"... and one extra colorless door to find. Apart from all those, there are a few special rules to use the dark meeple in the game (which interferes with Nightmare cards resolving), making the game easier or harder, depending on the chosen variant. 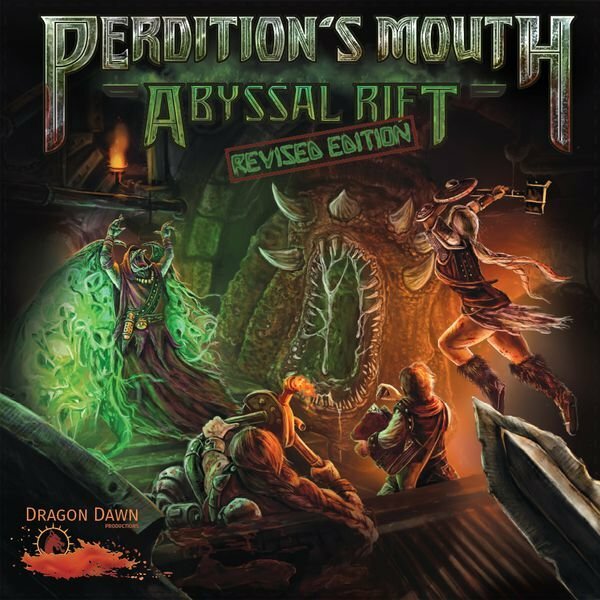 Perdition's Mouth: Abyssal Rift is intended to be a new kind of dungeon crawl, one that embraces the European school of game design with clever and elegant mechanisms and emphasizes strategy while minimizing luck. Cooperation, planning, and the enemy response deck eliminate the need for chucking dice, creating a tense combat environment with meaningful decisions! The rondels provide another tactical layer, including the enemy's devious and challenging AI. The rules allow you to learn to play in 15 minutes, with a typical game round lasting less than ten minutes, even with up to six players, but deep, strategic cooperation will be required for your band of heroes to make it through to the Abyssal Rift and maybe even come out alive. Perdition’s Mouth is designed to be played as a story-supported campaign over several gaming sessions. In the campaign, you have to fight through at least six increasingly challenging scenarios and the level of success during each adventure has a direct effect on the rest of the story. Can you survive the labyrinth of the insectoid god? The call comes in... "911, what is your emergency?" On the other end is a panicked response of "FIRE!" Moments later you don the protective suits that will keep you alive, gather your equipment and rush to the scene of a blazing inferno. The team has only seconds to assess the situation and devise a plan of attack – then you spring into action like the trained professionals that you are. You must face your fears, never give up, and above all else work as a team because the fire is raging, the building is threatening to collapse, and lives are in danger. You must succeed. You are the brave men and women of fire rescue; people are depending on you. This is what you do every day. 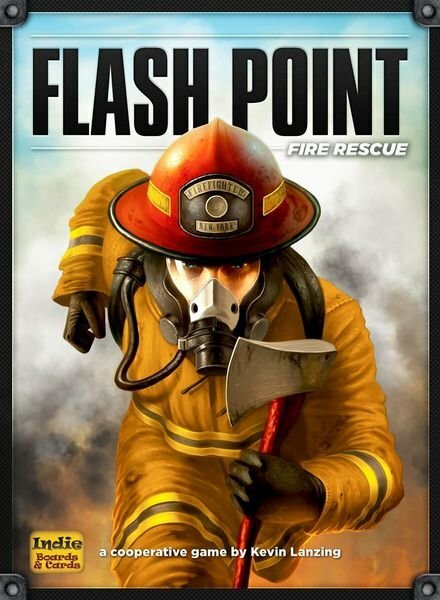 Flash Point: Fire Rescue is a cooperative game of fire rescue. There are two versions of game play in Flash Point, a basic game and expert game. In both variants, players are attempting to rescue 7 of 10 victims from a raging building fire. As the players attempt to rescue the victims, the fire spreads to other parts of the building, causing structural damage and possibly blocking off pathways through the building. Each turn a player may spend action points to try to extinguish fires, move through the building, move victims out of the building or perform various special actions such as moving emergency vehicles. If 4 victims perish in the blaze or the building collapses from taking too much structural damage, the players lose. Otherwise, the players win instantly when they rescue a 7th victim. The expert variant included in the game adds thematic elements such as flash over, combustible materials, random setup, and variations on game difficulty from novice to heroic. The game includes a double sided board with two different building plans and several expansion maps are available. a blog entry plaatste Lindoras in Bordspellen - wat is er gespeeld? De TafelTOP spelavond op woensdag is deze week verzet naar donderdag. Maar ja, toch zin in een stevig bordspel, dus prima geschikt voor een solo spel. Aangezien ik net de kickstarter van Nemo's War: Second Edition binnen heb, was de keuze helemaal niet zo moeilijk. Immers, Nemo's War is een echt solospel, zij het dat wat ook geschikt gemaakt is om co-op te spelen met een speciale kaarten. En er is zelfs een semi-competatieve modus voor teams.. Nemo's War is gebaseerd op Jules Verne's klassieke roman Twenty Thousand Leagues Under the Sea. Het verhaal gaat over Captain Nemo en zijn verbazingwekkende schip, de Nautilus. In het jaar 1870 reis je door de zeeën op missies van wetenschap, verkenning, anti-imperialisme en oorlog! Je verovert koopvaardijschepen, maar ook oorlogsschepen die dat uiteraard niet vanzelf toelaten. Ook zeemonsters komen op je pad en ook veroveringen (onder de noemer van bevrijding) aan land zie je als een opdracht. Ik heb op het Sailor niveau gespeeld zonder de diverse opties om het spel uitdagender te maken (lees moeilijker) en ook zonder de eerste uitbreiding van upgrade kaarten voor de Nautilus. Ondanks dat het zeker ook een dobbelspel is en er natuurlijk wel een zeker toevalligheid zit in kaarten die je op een bepaald moment krijgt, is het een pittig strategisch spel. Je kunt je kansen vergroten of verkleinen door de keuzes die je maakt, door de acties die je inzet. Verliezen kun je op veler manieren, winnen maar op één. En als je wint, hangt het nog van je score af. want heb je te weinig punten, verlies je alsnog. Anders kun je winnen op verschillende niveau's. Dit betekent dat je jezelf kunt verbeteren de volgende keren. Er zijn zoveel variaties mogelijk, dat ieder spel wel uniek te noemen is. Je kunt immers ook zelf vooraf je doelen stellen. Sterker je kunt halverwege je doelen helemaal bijstellen en een andere koers gaan varen. Heb uiteindelijk gewonnen op het allermakkelijkste niveau met 346 punten. Niet waard om vast te leggen. Ik ga volgende keer voor het echte werk: die van Officer. (Die van Captain is me nog even te ver weg, daar moet ik de kaarten nog beter voor leren kennen en ook wat de beste strategie is bij de doelen: Science, Explore, Anti-Imperialism of War). Tot slot: het thema is sterk, zeer sterk. En ja ook de artwork draagt hier aan bij. Het is een boeiend spel, waar je helemaal in kunt opgaan. Het is zeker een van de beste solo-spellen die ik heb. Ik waardeer dit nu minimaal met en 8,5. Mijn verwachtingen zijn hoog als het gaat om de volgende keren.